"Venus's girdle" redirects here. For the marine lifeform, see Ctenophora. Moon seen through the Belt of Venus. Note that the full Moon is near the centre of the field of view, which means that the Sun must be behind the camera, just below the horizon. The Belt of Venus, Venus's Girdle, or antitwilight arch is an atmospheric phenomenon visible shortly before sunrise or after sunset, during civil twilight, when a pinkish glow extending roughly 10–20° above the horizon surrounds the observer. As twilight progresses, the glow is separated from the horizon by the dark band of Earth's shadow, or "dark segment." The arch's light pink color is due to the backscatter of reddened light from the rising or setting Sun. A very similar effect can be seen during a total lunar eclipse. The zodiacal light, which is caused by the diffuse reflection of sunlight from the interplanetary dust in the Solar System, is also a similar phenomenon. The name of the phenomenon alludes to the cestus, a girdle or breast-band, of the Ancient Greek goddess Aphrodite, customarily equated with the Roman goddess Venus. Since the greatest elongation (separation) between Venus and the Sun is only about 46 degrees, the planet Venus, even when visible, is never located opposite the sun and hence is never located in the Belt of Venus. ALMA and Chajnantor at twilight. Lying between the two groups of antennas are the Earth's shadow and Belt of Venus phenomena. Full moon rising near Linz, Austria. Observed through the Belt of Venus. Belt of Venus photographed over a lake in Seattle, Washington. ^ "ALMA and Chajnantor at Twilight". ESO Picture of the Week. Retrieved 18 January 2014. Cowley, Les. "Belt of Venus". Atmospheric Optics. Les Cowley. Retrieved 2018-08-01. Naylor, John (2002). Out of the blue : a 24-hour skywatcher's guide. Cambridge: Cambridge University Press. p. 72. ISBN 0-521-80925-8. 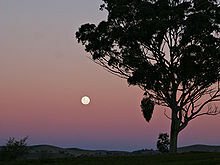 Wikimedia Commons has media related to Belt of Venus.